More people than ever are starting to see the benefits of completing oil to gas conversions in Hudson NJ. And when they are looking for a dependable and experienced company that has over 20 years of experience in this field, they contact Hudson Heating. 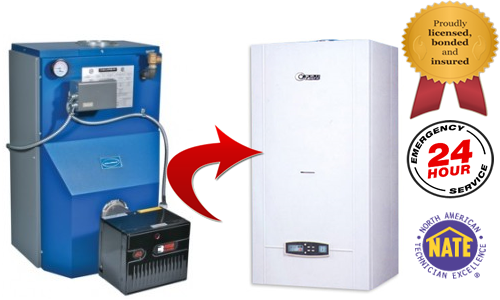 Over the years our professional team at Hudson Heating has converted many residential and commercial buildings heating systems from older and outdated oil systems to highly clean and energy efficient natural gas units. And with all oil to gas conversions we complete in Hudson County, you can be certain that our team will place your safety and that of your family and employees above all. No matter why you are considering an oil to gas conversion in Hudson NJ, one thing is certain – it’s much more reliable and safe than it used to be. Our company is insured, licensed and bonded to complete a natural gas from oil conversion. Natural gas is extremely safe to use in both commercial and residential applications, but only when it’s installed by a professional company that has over 20 years of experience in this area. And whether you need oil to gas conversion at home or the office, Hudson Heating is ready to undertake the job. Another benefit of considering an oil to gas conversion in Hudson is the environmental impact it offers. Natural gas produces much less emissions of carbon, nitrogen and sulfur than older oil systems. Plus, natural gas systems in Hudson NJ help reduce acid rain, smog and green-house gas emissions. Our team at Hudson Heating takes pride in helping protect our natural resources, and will install a quality oil to gas conversion for your home or office – at a price you can afford. Finding a dependable and trustworthy company to complete oil to gas conversion in Hudson NJ should begin with a phone call to Hudson Heating. Our company has the experience, professional and courteous staff that is eager to speak with you and answer any questions you might have. Contact us today to learn more about the oil and gas conversions in Hudson NJ we offer.